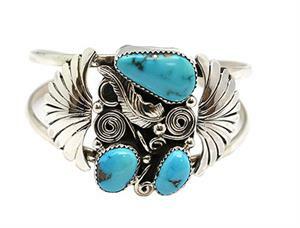 Sterling silver split shank bracelet with 3 free form turquoise stones, a fan on each side, a leaf and curly Q's. It measures approximately 1 1/2" wide in the center and tapers down. Handmade by Navajo artisan Kenneth Jones. Size and shape of stones will vary.